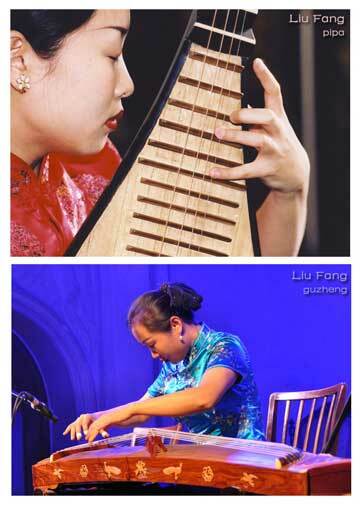 Born in Kunming (China) in 1974, Liu Fang started learning the pipa (Chinese luete) at the age of 6 and soon began to perform in public as child prodigy, including a performance for the Queen of England during a royal visit to China. Liu Fang received a number of provincial and national prizes, and graduated in 1993 from the Shanghai Conservatory where she has also learnt playing the guzheng. In 1996 Liu Fang moved to Montreal, from where she began an impressive international career, having given concerts all over the world and performing solo recitals at prestigious venues and festivals such as the Théâtre de la Ville in Paris, the Philharmonic Hall of Liège, Belgium (2006), BBC concerts in London (2003, 2007), the Bath International Music Festival (2004) and the York Early Music Center (2008), the TFF Rudolstadt 2006 and the WOMAD Festival in the UK (2004) and Spain (2006), Festival des musiques du monde les suds à Arles (France), etc. Liu Fang has built a remarkable artistic profile by captivating audiences and critics with her masterful, rich and deeply-spirited pipa playing as well as wide ranging repertoire. Celebrated in the press as the “divine mediator” (World, 2006), “without question the greatest ambassadress of the art of the pipa in America and Europe” (La presse, 2002) and “the empress of pipa” (L'actualité, 2001), Liu Fang is known as “possessing virtuoso technique, grace and a unique empathy toward the music she plays – whether it is a traditional and folk tune or a modern Western composition” (All Music Guide, 2003). Her playing is described as “Masterful, graceful and riveting” (BBC, 2004). On November 16, 2005, Liu Fang was invited to perform at the concert dedicated to the 60th anniversary of UNESCO in Paris. Among the numerous solo concerts, Liu Fang has performed with symphony orchestras, string quartets, and ensembles, collaborated with musicians from different cultural and musical backgrounds. She has produced 11 CDs on solo and collaborations, and often appears on radio and TV(national and international). Due to her excellent achievements, Liu Fang was awarded the Millennium Prize for Future Generations by the Canada Council for the Arts in 2001 and the prestigious French Academie Charles Cros Award(the French “Grammy”) in 2006. Montreal resident Liu Fang has achieved an international reputation for her masterful and deeply spirited pipa playing. Born in 1974 in Kunming in the Chinese province of Yunnan, Liu Fang began studying the pipa at the age of six and gave her first public performance as a pipa soloist when she was nine. In 1985, she played for Queen Elizabeth during Her Majesty's visit to China. Honoured with several provincial and national prizes, Liu Fang graduated from the Shanghai Conservatory of Music, where she also studied the guzheng, a Chinese zither. Since moving to Canada in 1996, Liu Fang has built a remarkable artistic profile by captivating audiences and critics with the richness and grace of her playing as well as her wide ranging repertoire. 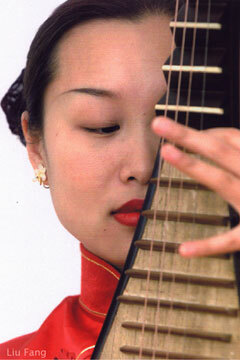 Liu Fang is most well-known for her virtuosic and expressive interpretation of traditional pipa and guzheng music from the classical and folkloric traditions. Celebrated in the press as being “divine mediator” (World, 2006), "the empress of pipa" (L'actualité, 2001) is able to transmit in an erudite and significant way the beauty and the richness of this ancient music as well as the subtle sonorities of the instruments by the power and sensibility of her play. Among the numerous solo recitals, concerto performances and concerts at festivals throughout Canada, the U.S., Europe and South America, Liu Fang did succesful music tours with Debut Atlantic, Jeunesses Musicales (Canada, France, Belgium), and has premiered new compositions by a number of accomplished composers. In fact, she has appeared in the spectacular world premier of R. Murray Schafer's opera The Palace of the Cinnabar Phoenix, playing outstanding solos on both the pipa and the guzheng. She has also collaborated with traditional master musicians from various traditions. She performed two concerti for pipa and orchestra (the "Ghost opera" by celebrated Tan Dun and the "King Chu Doffs his Armour" by Zhou Long) with the Moravia Symphony Orchestra in Prague (1999), and in November 2003 she performed with the orchestre des pays de Savoie in France improvised music in Gustav Mahler's "Liede der Erde" (Song of the Earth) and was highly praised (in Le Monde de la Musique, No. 282). Recently Liu Fang performed with the Nouvelle Ensemble Moderne and SMCQ in Montreal, Manitoba Chamber Orchestra, the Windsor Symphonic Orchestra, the Alcan string quartet in Canada, the Quartetto Paul Klee Venezia and Xenia Ensemble in Italy, and the Spiegel String Quartet in Belgium. Since last year she has been collaborating with Malcolm Goldstein, an internationally renowned violin maestro, on new and improvised music. Liu Fang has also made numerous national and international radio recordings and television appearances, given performances recorded for films. For instance, Liu Fang has been invited as one of the featured artists (including also the world renowned Russian violinist - Vadim Repin) by BBC World Service for the concert on November 7, 2003 dedicated to World AIDS Day. The recording of this concert has been broadcasted in all of the 43 World Service Language Services with the current World Service audience across all platforms in the region of 150 millions. On November 16, 2005, Liu Fang was invited to perform at the concert dedicated to the 60th anniversary of UNESCO in Paris. Recently, Liu Fang was one of the three featured artists in a one-hour documentary film produced by Bravo-Canada (broadcasted by CBC TV on January 12 and repeated on April 5, 2008). Liu Fang has been awarded a number of grants by the Canada Council for the Arts. On June 5th, 2001, she received the prestigious Future Generations Millennium Prize from the council. 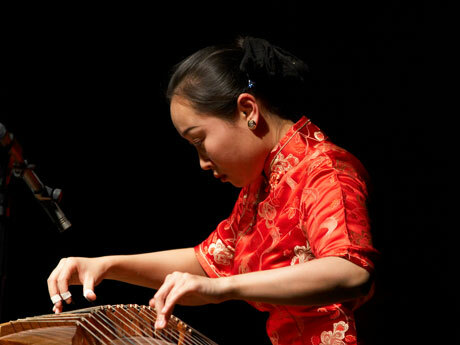 In the jury's words: "Liu Fang's mastery of the pipa and the guzheng has established her international reputation as a highly talented young interpreter of traditional Chinese music. She aspires to combine her knowledge and practice of eastern traditions with western classical music, contemporary music and improvisation, thereby creating new musical forms, uniting different cultures and discovering new audiences." Liu Fang has produced 11 CDs, including 3 solo pipa CDs entitled “The soul of pipa Vol 1-3” which is an anthology of pipa music from the ancient classical tradition to the most recent compositions and folk style music. One guzheng solo CD of traditional music, and 6 other CDs in solo and collaboration with musicians from different cultural backgrounds (see discography for details). Due to her latest album entitle “the silk sound” produced by the French label Accords Croises and Harmonia Mundi, Liu Fang received the prestigious l'Académie Charles Cros award in 2006. Portrait of Liu Fang by Daniel Brown, Mondomix, 2006.